On this particular day, a very pregnant Dina wakes up to a report of a possible terrorist attack in her hometown of Haifa which is normally a relatively safe place to live. Of course, she is concerned but her fears become almost all-consuming. She doesn't want to let her son go to school even as she heads to her job as a doctor, and she seems to be overwhelmed as the violence of her family's past merges with her current life. Tension builds in the story as Dina becomes more frantic, and it's apparent that something big is going to happen. This review is really difficult to write for me. I don't know if my description did justice to the book, and I'm also having a hard time articulating my feelings for the novel. On one hand, I found the author's presentation to be clever; and on the other hand, I didn't really appreciate any of the characters. I found the mother's constant prodding to be annoying at times, but I did understand why she kept appearing to Dina. I felt for Dina as the violence of her past became a possible reality in her present, but I didn't always enjoy the descriptions surrounding Dina's day. See what I mean? I am all over the place and obviously conflicted with my feelings about THE WAITING ROOM. So I guess I will focus on what I did appreciate about the novel. I really enjoyed the major themes of the story. For the most part, I liked how the author created a sense of urgency in the novel, and I thought she effectively conveyed the fear of living in a world where terrorism exists. I also thought she did a very nice job in showing the fragility of human life, especially in the way she juxtaposed the loss of life with a pregnant Dina. In addition, although I didn't always love the appearance of Dina's mother, I appreciated that the author was tying the present to the past for Dina. These scenes made Dina really examine the plight of her parents as well as how she wants to deal with the potential threat in her life. They also made the reader think about the themes of memory and survival. 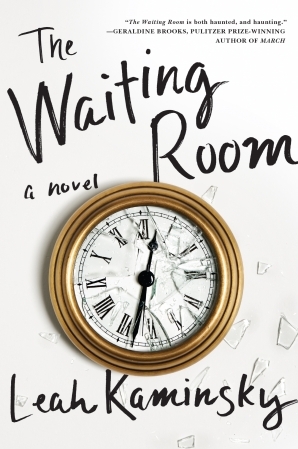 Overall, I'm pretty confused about THE WAITING ROOM, but that's not necessarily a bad thing. While I didn't love every aspect of it, I appreciated it... and the novel made me think. And honestly, that's not a bad thing for a book to make a reader do! I'm probably not smart enough for this. I just read another review of this one and it gave a different aspect of the book. They also said it was a difficult read! Thanks for your review.